For training in the yard, at the park, or on the go. Wherever you go, your pet is by your side. 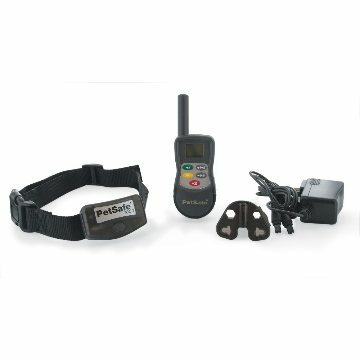 Train your pet to stay by your side without a leash with the PetSafe Elite Big Dog Remote Trainer. At the push of a button, your remote sends a signal activating your dog's receiver collar. He receives a safe but annoying stimulation. He'll quickly learn the association between his behavior and your correction; in no time, you'll have a better-behaved pet. You can add a second dog to your Big Dog Training Collar so you can train two dogs simultaneously. All you need is the PetSafe Big Dog Trainer Add A Dog Collar. Large digital display on transmitter with symbols for quick reference.